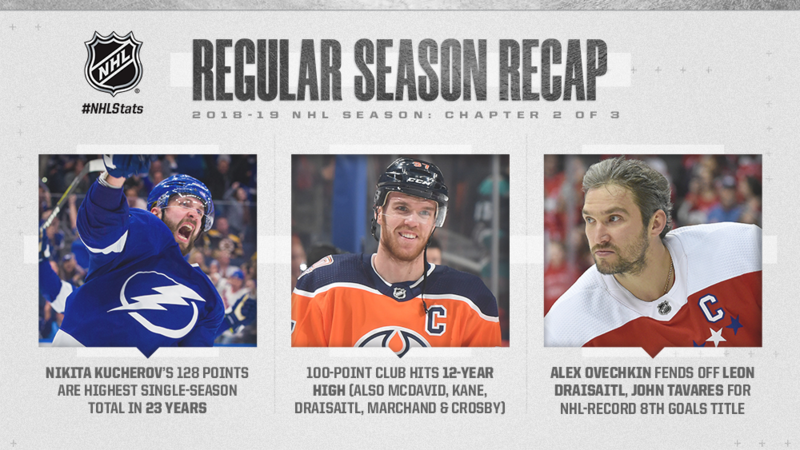 The 2018-19 season saw NHL players reach heights not seen by an entire generation of hockey fans, with Art Ross Trophy winner Nikita Kucherov (41-87—128) leading a group of six 100-point players and Alex Ovechkin (51-38—89) – the first player in NHL history to lead the League in goals eight times – pacing 13 players who scored 40 or more goals. * Kucherov hit the 100-point mark in just his 62nd game – the fastest in 22 years – en route to the highest single-season point total by any player in 23 years (1995-96: Mario Lemieux: 161, Jaromir Jagr: 149). * For the first time in 12 years, six players topped 100 points, with Connor McDavid, Patrick Kane, Leon Draisaitl, Brad Marchand and Sidney Crosby joining Kucherov in the century club. * Ovechkin led the League in goals for an NHL-record eighth time, becoming the first in 44 years – and just the sixth in NHL history – to pace all players in goals at age 33 or older. Lightning forward Nikita Kucherov captured his first Art Ross Trophy with a career-high 128 points – 12 more than his next closest competitor in the scoring race. Kucherov hit 100 points in just his 62nd game – the fastest in 22 years – en route to the highest single-season point total by an NHL player in 23 years. * Kucherov, who had 39-61—100 in 2017-18, became the first player in Lightning history to post multiple 100-point campaigns. He also set single-season franchise marks for assists and points. * A native of Maykop, Russia, Kucherov’s total is the highest ever recorded by a Russian player, besting the previous mark set by Alexander Mogilny (76-51—127 in 1992-93). He also is one of four Russian players to record consecutive 100-point campaigns, joining Pavel Bure(1992-93 to 1993-94), Evgeni Malkin (2007-08 to 2008-09) and Alex Ovechkin (2007-08 to 2009-10). 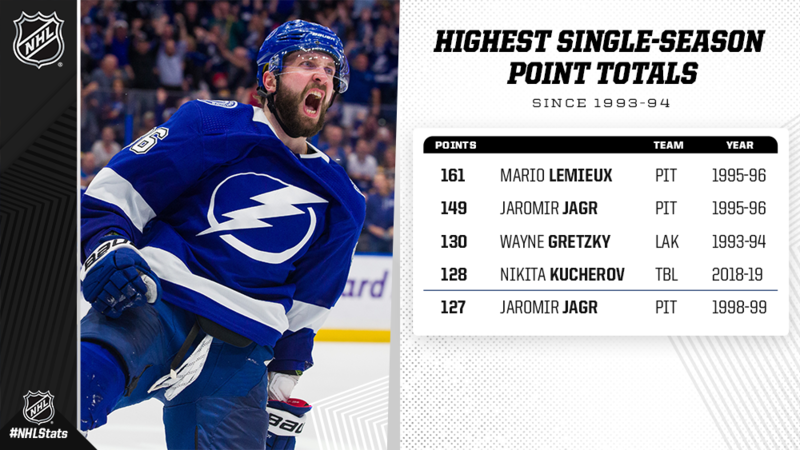 * Kucherov became the first player in 23 years to record eight four-point performances in a single season – Mario Lemieux (16x), Jaromir Jagr (9x), Peter Forsberg (9x) and Adam Oates (8x) all did so in 1995-96. Kucherov’s total includes a pair of career-high five-point outings. * Additionally, Kucherov dished out 87 assists, the highest total by an NHL player since Joe Thornton posted consecutive 90-assist campaigns in 2005-06 (96) and 2006-07 (92). He is the only Russian to record 80 or more assists in an NHL season. For the first time in 12 years, at least six players topped 100 points, with Connor McDavid (41-75—116), Patrick Kane (44-66—110), Leon Draisaitl (50-55—105), Brad Marchand (36-64—100) and Sidney Crosby (35-65—100) joining Nikita Kucherov (41-87—128) in the century club. Seven players posted triple-digit point totals in 2006-07. * McDavid, who had his streak of consecutive Art Ross Trophy wins snapped at two by Kucherov, posted his third straight 100-point campaign to become the fifth player with three or more 100-point seasons before age 23 (four each for Wayne Gretzky, Mario Lemieux, Dale Hawerchuk and Crosby). * McDavid became the 19th player in League history to reach the 100-point mark in three or more consecutive seasons, joining Alex Ovechkin (2007-08 to 2009-10) as the only active players to do so. * Kane’s 110 points represented a new career high, topping his previous best set in his Art Ross Trophy-winning season of 2015-16 (46-60—106). He joined Denis Savard (5x) and Jeremy Roenick (3x) as the only Blackhawks players with multiple 100-point seasons; Savard is the only player to record more points in a season for Chicago. Kane also is one of five U.S.-born skaters with multiple 100-point seasons, joining Roenick, Jimmy Carson (2x), Pat LaFontaine (2x) and Kevin Stevens (2x). * Draisaitl became the first German born-and-trained player to record a 100-point season. He and McDavid became the first set of Oilersteammates with 100 or more points in a season since Jari Kurri and Carson in 1988-89. Prior to the Oilers duo, the most recent set of teammates on any team to reach 100 points in a season were the Capitals tandem of Ovechkin and Nicklas Backstrom in 2009-10. * At age 30, Marchand reached 100 points for the first time in his career to obliterate his previous career high (85 in 2016-17 and 2017-18). He became the 13th player to record his first 100-point campaign in his 10th NHL season or later and second in as many years (Claude Giroux: 11th season in 2017-18) and the first Bruins player to hit the benchmark in 16 years (Joe Thornton: 36-65—101 in 2002-03). * Crosby reached the 100-point mark for the sixth time in his NHL career, trailing only Lemieux (10x) for the most such campaigns by aPenguins player. Only five players in NHL history have recorded more 100-point seasons than Crosby: Gretzky (15), Lemieux (10), Marcel Dionne (8), Mike Bossy (7) and Peter Stastny (7). * The 2018-19 campaign marked the fourth time in the last 22 years that at least three players age 25 or younger hit 100 points in season (Kucherov, McDavid and Draisaitl). The other campaigns since 1996-97: 2005-06 (Ovechkin, Dany Heatley, Crosby, Eric Staal), 2008-09 (Evgeni Malkin, Ovechkin, Crosby) and 2009-10 (Crosby, Ovechkin, Backstrom). 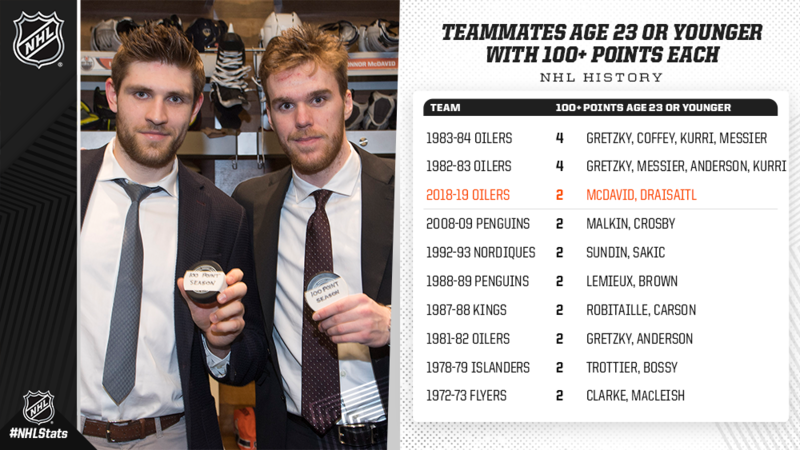 * Additionally, it was just the 10th time in League history – and second in the past 25 years – that teammates age 23 or younger hit the century mark in the same season (McDavid and Draisaitl). * The combination of Kane, Marchand and Crosby marked the first time in 25 years – and just the third time in League history – that three players in their 30s each hit 100 points. Phil Esposito, Jean Ratelle and Vic Hadfield combined for the fist such instance in 1971-72, while Gretzky, Adam Oates and Doug Gilmour followed suit 22 years later in 1993-94. A year after capturing the first Stanley Cup of his career, Alex Ovechkin showed no signs of slowing down as he led the Capitals to their fourth-consecutive Metropolitan Division title while capturing the Rocket Richard Trophy for an NHL-record eighth time and notching his eighth career 50-goal season. * Leon Draisaitl (50) joined Ovechkin in the 50-goal club, two of 13 players who topped 40 goals, with one other knocking on the door of the 50-goal mark: John Tavares (47). Draisaitl joined Wayne Gretzky (8x), Jari Kurri (4x), Glenn Anderson (2x) and Mark Messier as just the fifth player in Oilers franchise history to score 50 goals for the team in a single season. Tavares’ 47 markers were the most by a Maple Leafsplayer since Dave Andreychuk in 1993-94 (53). * Draisaitl and Tavares recorded the highest single-season goal totals by any player other than Ovechkin since 2011-12 (Steven Stamkos: 60 and Evgeni Malkin: 50). Ovechkin’s one-goal edge over Draisaitl was his closest goals race in a Richard Trophy-winning season (previous: 3 over Stamkos in 2012-13). * Ovechkin, 33, became the first player in 44 years to lead the League in goals at age 33 or older. Only five other players in NHL history have accomplished the feat: Bill Cook (age 36 in 1932-33), Nels Stewart (age 34 in 1936-37), Gordie Howe (age 34 in 1962-63), Phil Esposito(age 33 in 1974-75) and the trophy namesake, Maurice Richard (age 33 in 1954-55). 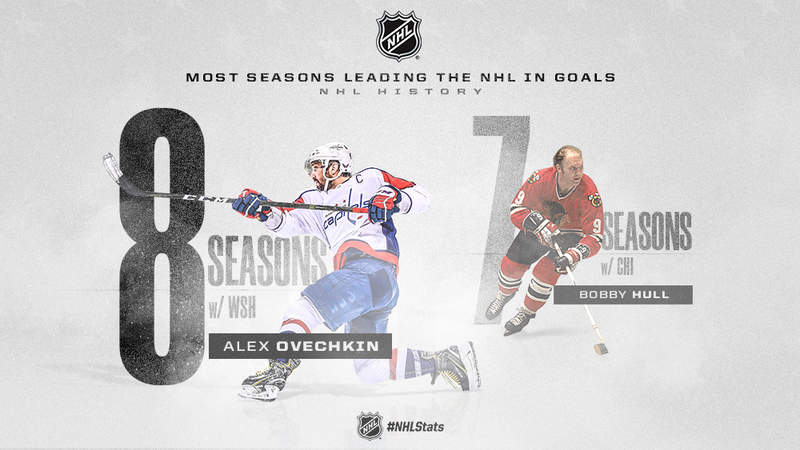 * Ovechkin became the third player in League history to post eight or more 50-goal seasons, a list topped by Mike Bossy and Gretzky (nine each). * Additionally, Ovechkin became the fifth player in NHL history to record multiple 50-goal seasons after his 30th birthday, joining Esposito (4x), Hull (2x), Marcel Dionne (2x) and Mario Lemieux (2x). * Overall, Ovechkin (33 years, 194 days on March 30) became the third-oldest player to record a 50‑goal campaign, trailing Johnny Bucyk(35 years, 308 days) and Jaromir Jagr (34 years, 37 days). * Adding to his list of accomplishments, Ovechkin (658-553—1,211) and longtime rival Sidney Crosby (446-770—1,216) each reached the 1,200-point milestone in 2018-19 to vault into the top 50 in all-time League scoring (Crosby: 44th, Ovechkin: 45th).